Dosan has been recognized and memorialized by many different organizations at locations in the United States and in other countries. Dosan Park is a beautiful location opened in 1973 when the Tomb of Dosan Ahn Chang Ho was moved from Manguri and buried together here with his wife, Lee Hyeryeon. At the park, there is a statue of Dosan and many monuments. 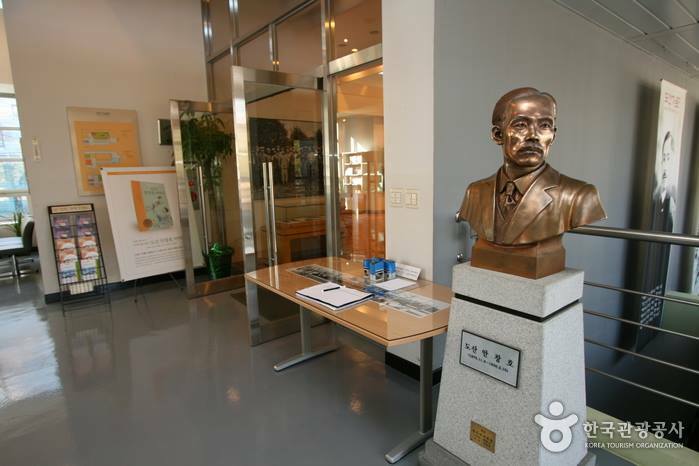 At the Dosan Ahn Chang Ho Memorial Center, there are pictures from Dosan's life and the Independence Movement, Dosan's diary, and other artifacts and archival material on display. Dosan himself never lived at the Ahn House at USC. It retains great historical significance because of its function as a central location in the Korean community in America. While Dosan was traveling the world to fight for independenc from Japan's evil colonial rule in Korea, the Ahn family was living in Los Angeles. All the Ahn children were born in Southern California. But, Dosan never lived South of Wilshire Blvd while he stayed in America. Helen Ahn resided in the house on what is now the USC campus with the five Ahn children from the 1936 to the early 1950s. All of the homes in San Francisco, Riverside and Los Angeles where the Ahns lived served as an important gathering places for many Korean-Americans and Independence Movement work. Original location of Ahn Family House at USC near the Engineering Department. This photo was taken in 1995 before it was moved and rennovated to be the USC Korean Studies Institute Office.